Since being first revealed back in December, details about the upcoming Marvel’s Guardians of the Galaxy: The Telltale Series has been relatively unknown until now. is a brand new story of the universe’s unlikeliest heroes: Star-Lord, Gamora, Drax, Rocket, and Groot. In the wake of an epic battle, the Guardians discover an artifact of unspeakable power. The series would be nothing without its voice talent, it will star: Scott Porter (Friday Night Lights, The Walking Dead: The Telltale Series) as Star-Lord, Emily O’Brien (The Young and the Restless, Middle Earth: Shadow of Mordor) as Gamora, Nolan North (the Uncharted series, Pretty Little Liars) as Rocket, Brandon Paul Eells (Watch Dogs) as Drax, and Adam Harrington (The Wolf Among Us, League of Legends) as Groot. There’s another name you might know me by! …Star-Lord … Who? We’re the fricking Guardians of the Galaxy! 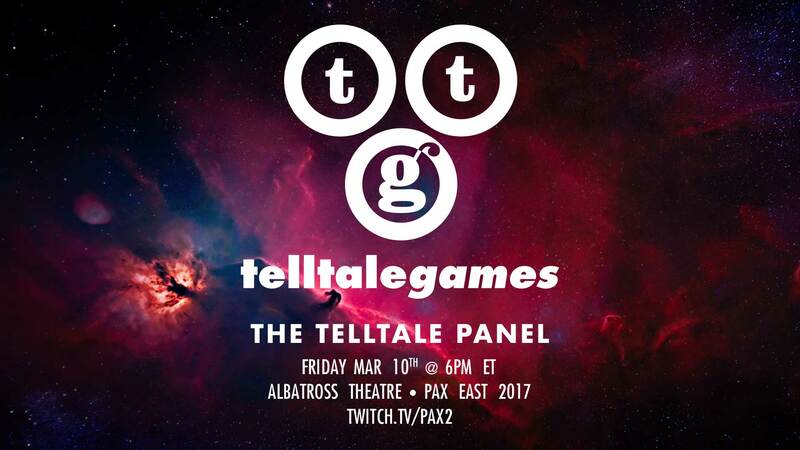 Telltale will be holding at panel at PAX East, which will be live-streamed on Twitch. Details in the image below. Then on March 17th at SXSW in Austin, TX, fans will be part of the first audience to Crowd Play an early version of the first episode of the series at an event at the Paramount Theater, which starts at 6:30pm. Audience members will be able to help influence choices during the play through using their smartphone. Marvel’s Guardians of the Galaxy: The Telltale Series will be releasing later this year and will be available at retail as a season pass disc which includes the first episode and the four episodes that follow as they become available to download. Marvel and Telltale haven’t revealed which platform the series will be available but going with past Telltale releases, they tend to release on consoles and PC at the same time and a mobile release much later.